Firefox is five years old. We thought that we would celebrate that by talking about how the web has changed over the last five years and Firefox’s role in those changes. 2009 has been an interesting year. We’re at a crossroads for the Internet. In the next 12 months or so we’re likely to see regulation of the Internet in the United States – possibly for good, possibly for bad. We’ve seen increased interest in the browser space with the entrace of Google with their minimalist Chrome browser. Mozilla put a vastly improved rendering engine into the hands of hundreds of millions of users with the release of Firefox 3.5. The EU is working with Microsoft to implement a ballot to make users aware of browser choice. No one could possibly say that things are boring right now. And this has only been over the last year. But what has changed over the last five years? What are the main themes? We’ve picked a few to talk about and we hope that it helps put things into perspective for the next five. Over the last five years we’ve been setting ourselves up for the next five. The web is moving faster, not slower, and modern browsers are set to handle it. Firefox’s growth on the web has had another important effect – bringing standards to the forefront of development. Very early in the Mozilla project almost half of the web’s HTML pages started using DOCTYPE in order to opt-in to standards mode for many web browsers. Developers signaled that they wanted to use a standards-based method for development. That’s important. It set up the current frame for development on the web that we have today. It allowed Apple to take KHTML and turn it into Safari which then allowed Chrome to pick up that work and enter the market and render a standards-based web. Now we don’t have just one or two browsers, but many, and a lot of that has to do with the way that early web developers approached development. Standards matter, and they should continue to matter. When they do those individual human beings we like to call users benefit with greater choice and fast innovation. Led by Firefox’s add-ons system there’s been an explosion in the number of people who are customizing their experiences – both in browsers and on the web. Anywhere from one third to one half of Firefox users have some kind of add-on installed. The web is unique, and was built to be hacked. No other widely-deployed system in the world delivers itself as source code like the web does. And this transparency has made it possible for the distributed innovation that we’re seeing in Firefox and on the web. People patching new UI into their favorite web sites, mashing up data from multiple sources or radically changing the feel of the browser itself – this is a source for inspiration for browser vendors and web site operators alike. For the first time individual people have the ability to take an active part in the future of their computing experience. It’s also worth noting that Gecko and Firefox are unique in this space. The highly modular nature of Gecko mixed with the fact that Firefox itself is written in HTML and XUL (another UI-focused markup language) means that it’s the only browser that’s hackable like the web is. Every other browser is built as a monolithic desktop application from the last millennium. This natural advantage not only means that Firefox has the widest array of add-ons and developers, but is also a source of inspiration for most of the rest of the market. In the last five years one of the big changes we’ve seen is web sites offering up data and feeds. Feeds in particular have reached the point where even non-technical people know what they are and how to use them. The ubiquitous RSS icon, which was originally created for the Firefox browser and given away by Mozilla, now exists on millions of web sites offering users the ability to get updates on their terms. But we’ve gone far beyond just simple feeds. Advanced APIs are now appearing for web sites so you can integrate native applications, build a Firefox extension or be able to pull your data out of a web site. And we’ve also moved from the promise of XML to the reality of JSON as the data format of choice. In the last few years we’ve seen Youtube become one of the largest sites of the Internet, the launch of Hulu, and sites like Netflix offering premium on-demand video right over the Internet to web browsers and devices alike. We’ve also seen millions of people create their own videos and publish them to the web. We’ve also seen the launch of open video and native video support in browsers to bring the creativity and hackability of the web to currently closed video platforms. The rise of the web is a story of anyone being able to create a web site. But that’s still a largely technical exercise, even with tools. What we have seen, thanks to tools like WordPress and blogger, is the growth of weblogs, feeds and data which make it possible for anyone with a web browser to become a publisher or journalist. And it has moved well beyond just text. People with low-cost tools are making movies and posting them. Remix culture is alive and well, creating comentary and new and exciting creations – all in the hands of pretty normal people. The iPhone taught us that you could build a decent browser for mobile phones and that data was important. Phones, really just in the last five years or so, have shown us that access to data plans that look like what you can get to your house can unleash developer and user creativity. In the last five years at Mozilla we’ve also made the commitment to build a browser for mobile devices. We’re still in an early pre-1.0 beta stage, but that browser is already getting excellent reviews. So what about the next five years? Mozilla has been at the heart of many of the issues of the Internet over the last five years. We’ve vastly improved the browsing experience for hundreds of millions of people around the world. We’ve managed to keep Microsoft honest and forced them to release newer versions of their browsers. Firefox’s presence was a large factor in Apple being able to ship a browser to its user base as the Mac came back to the market. We’ve made it possible for third party browser vendors like Google to enter the market. We’ve proven that people care about improving their experiences on the web. We’ve given over 330 million people the taste of what it’s like to use an open source product. And we’ve overseen the technical growth of the web through direct action and standardization. It’s hard to beat that, but we’re going to try. We’ll continue to make competitive browser releases and improve people’s experiences on the web. We’ll continue to innovate on behalf of developers and bring those improvements to the standards space. And we’ll continue to grow our amazing global community of users, developers and activists. Over the next five years everyone can expect that the browser should take part in a few new areas – to act as the user agent it should be. Issues around data, privacy and identity loom large. You will see the values of Mozilla’s public benefit mission reflected in our product choices in these areas to make users safer and help them understand what it means to share data with web sites. Expect to see big changes in the video space. HTML5-based video and open video codecs are starting to appear on the web as web developers make individual choices to support a standards-based, royalty-free approach. Expect to see changes in the expectations around the licensing of codecs. And over the next five years mobile will play an increasingly important role in our lives, and in the future of the web. The decisions of users, carriers, governments and the people who build phones will have far-reaching effects on this new extension to the Internet and how people will access information for decades to come. Mozilla has a unique place on the Internet. Driven to help improve it as part of our mission expect us to express opinions on decisions that affect its future. We act both through direct action but also through indirect action – sometimes our effects are as important as our actions. We will continue to protect users and we’ll continue to do everything they can to make it possible for the next set of people to come along and build the next great web site. It’s been a great five years. Let’s make it another five and keep the web moving forward for the benefit of everyone. Good Run Firefox.. Keep going and do miracles.. Happy Birthday Firefox! I’ve been using it since Version 1.5 and its awesome. As Pandian said, keep going and do miracles. Keep up the great work! Tons of luck to Mozilla team! The web owes a lot to this browser. You have used your powers for good and not evil – and the web has won. Oops sorry for double comment, but I’ve actually been using Firefox since Version 1.0. This is an amazing post…thanks for summing it all up and putting it in such great perspective! Well done to everyone who has been part of making Firefox what it is. Thank you Firefox for making our web a better place. Happy birthday FF. I hope that “The Mighty Beast” will be in out lives for many many years. Yes, as your article states FF has shaped the web, and it has done it more than anything out there. In my view, FF was the next thing to hit after Navigator in the history of web. Have you guys ever wondered when coding, that you actually write history? I mean, think about it. You wrote the best browser out there and it goes to the books. Congratulations about that.! One last thing, Keep this article with you. Display it five years from today! We will see what we could achieve and what we could not! Five years is not a long time. Keep Rocking Foxy, we love you! Great job, Firefox. You do make our life as web developers easier. Thank you developers!, you are trying to make this world a better place! you good people are doing excellent work! many thanks! Belated *10-year* anniversary best wishes for the Mozilla M4 release on 1999-04-15. (Kickin’ it old school Y2K-style ;-) ). Many Happy Returns… It’s been fantastic run. I have used firefox for pretty much whole of last 5 yrs and I am sure many more to come. nice bit of looking back to see what’s ahead. fun – made me dig up this timeline http://upload.wikimedia.org/wikipedia/commons/7/74/Timeline_of_web_browsers.svg – keep that orange line going strong! Saludos, abrazos y felicidades a todos los que hacen sin ninguna retribucion Firefox! Congrats on 5 years. I still fondly remember installing Firefox (Firebird) 0.7 on my Blue & White PowerMac G3 in college. I loved that I could get the same browser experience in multiple platforms and I am glad that holds true still today. Great job everyone, but no slacking! IE is still the big dog (less big, but still big) so keep the innovation coming and go get ’em! Congrats, firefox! Keep the awesome flowing! Thanks for saving us from the dark trecherous thing that was the web (and ie). I’ll join the crusade as soon as i have my coding skills up and running. Cheers! Hey Great Job Done Firefox people….CONGRATS!!! It wasn’t long after I got my first DSL line installed at my home, the same year that I discovered Linux (command line Slackware) which started my love for Open Source software, and I had just got my first LCD screen(lets just say it was a good year XD). I remember my neighbor bringing over a CD-ROM Disc and telling me I had to see what was on it. Before even thinking, I popped it in my, at the time, 5-year-old gutted Gateway tower and began installing something I had never heard of. I remember asking him what it was and his response was simply: “You are going to love this, trust me!”. He wasn’t kidding, I didn’t know it at the time, but this simple disc held the software that I would soon fall in love with. Contained on that ordinary and simple disc was the not-so-ordinary FireFox beta. At first, honestly, I wasn’t impressed, I laughed and told him, “Ok…looks a lot like Netscape to me, what’s the big deal?”. He told me to play with it for a while and give a chance, so I did. To this day I still don’t know where he got it, nor do I really care, but it opened my eyes. By the end of the week I had said goodbye forever to IE and Netscape (Anyone else remember the old Netscape?). FireFox quickly spread across the net. More and more people were tweaking it and releasing addons, and I downloaded every single one in the beginning. I couldn’t get enough and my poor little FireFox was soon overburdened with so many addons it would barely launch. It was then that I realized that I didn’t need everything and I started to pick-and-choose what I used. I still don’t think I have it perfect, but as more addons come out and I add and subtract as I go along it get’s closer every day. I have stuck by my little FireFox and with every new release I gain a little more respect and love for the little browser. FireFox hasn’t always been perfect, but I suffered through the bad times with it so I could reach the better times ahead. I remember the greatness of the 1.0 and 2.0 releases and the small fan groups I was with when they were officially release. There were 6 of us for the 1.0 all waiting for it to go live on the Mozilla site. I still have the disc I won from the Mozilla store that has the original 1.5.04 version of Firefox and Thunderbird(Looking back those were my favorite days of using the browser, when everything was still new and fresh). By the time 2.0 was released there were about 40 or so people gathered at a friends house for the official release, it wasn’t the smartest thing to do actually, took us forever to download it sharing one connection, but we waited “patiently” together for the bar to finish its slow movement across the screen. Big cheers went up when one finally finished. It didn’t take too long before FireFox was back on my desktop, and back in my Dock. Now my little browser is back where it belongs and it is stronger than ever. I was there near the begining and I will be there till the end, as long as it is around I will use and love FireFox! I will always be a fan and supporter! Alles Gute zum Geburtstag! Auf weitere 5 erfolgreiche Jahre! It’s good know that I’ve beening with the firefox all this time seen all these changes! I’m so proud and happy to use Firefox! You’d got the web back, now will drive it to the future! Five Years of excellence,success and Glory. You guys rock!Carry on the Good Work! Amazing post.Keep up the awesome work Mozilla! Without you the web would not be the same. Great work Firefox… Congrats and all the best for all your future contributions to the web. Awesome post. As a long time user and developer I can’t thank you enough for all the work you’ve done, both directly and indirectly, to improve the “web”. Thanks Firefox. Without Firefox, IE would not be the great browser it is today. Happy Birthday Firefox, you’re the best!! and for a Smiths/Morrissey such as I, a name like MOZilla can’t beat anyone else!! thanx 4 all!! I remember way back in high school (okay, only 5 years ago, but still), my parents wouldn’t let me install Firefox on their computer because they thought it was insecure and a virus. So I ended up installing it on my massive 128MB flash drive and running it off of there. I remember installing fire fox when it came as an application tool on a CD in a computer tech mag when it first evolved. The best part afterwords was having not to depend on IE any more and the fox kept me on the internet. Way to go Fire Fox I was dreading to see the day you would disappear and very thankful your success with creativity has brought you this far. Happy B-day and hopefully you will around for generations to come and be able to keep the pages rolling. KEEP GOING AND MIRACLES . KEEP UP THE GREAT JOB!!!!!!!!! Joyeux anniversaire de bonnes continuation a vous !! Continuez a nous faire rêver avec vos nouvelle mise a jours et continuez a bosser dur ! I’ve used Firefox since 1.0, but it wasn’t until it was into its 2.0 series that I had begun to use it regularly and replaced IE as my default browser on my own PC. Since then, I’ve never gone back to IE (unless I had to reinstall Firefox). Firefox has revolutionized web browsing, and personally it changed the way I do my web browsing and my perception of the internet–for the better of course. To the founder, developers, and other staff at Mozilla, thank for for bringing the great gift to the world wide web that is Firefox. Your innovations are nothing short of spectacular and I’m looking forward to future projects from you. Here’s to 5 years and 15 more. Happy Birthday FIREFOX! Will always be my Browser! Vielen Dank! ***Happy Birthday Firfox ****, good post about next five years for web. I live in a part of the world where the world of the internet is virtually foreign to many. I have my own pc now, but I used to read a South African computer publication called SACM and enjoyed reading problems that people had about the computers even though I did not have one. I believed that I was preparing myself for the future by reading about computers whilst I could not even afford one at the time. At the time I thought that the monitor was the computer. And I remember reading a great review on SACM or South African Computer Magazine about this browser by Mozilla called Firefox. Whilst almost everyone uses the default browser IE at work, I used Firefox. I have been promoting its use here at BCL Limited even though there are some who can or only want to see the world through IE. I was the only person who could access the web yesterday here at BCL Limited. BCL Limited is a mining and smelting company here in Selibe-Phikwe in Botswana. I did that because I used Firefox whilst others failed using IE. As a devotee since 0.93 – and before that the Mozilla Suite – I just wanted to say thanks for releasing me from IE6 into a new and better web life! Alles gute zum 5 jährigen! Firefox ist das beste was es gibt! Auf weitere schöne Jahre mit FIREFOX! Love you Firefox thanks for filling the gap. I cant imagine what firefox will be in the next 5 years! 5 year ago… we are limited, but now unlimited with Firefox. A vida de nos navegadores da web, parabéns pelos 5 anos! i remember when my mate dani first told me about this back in mid 05, i think the mighty firefox was into ver-1.5 at this time and i loved it, i soon developed a nice tasty dislike for microsofts idiot explorer. THE MOST TRUSTED WEB BROWSER EVER! HAPPY BIRTHDAY! Jestem z Polski i ciesze sie ze moge korzystac z Firefox, a korzystam juz 3 lata. Uwielbiam Was!!! Greetings from Bulgaria!I’ve tried many browsers around the years, and i can tell, FIREFOX is the best one there is.Thanks for the great browser, and keep up the good work! Happy Birthday Firefox from Austria! Internet would be sh*t without you! woohoo!! happy 5th anniversary Firefox! The Mozilla team is really amazing! internet exploder? did i dream that? spelling has always bean a problem on the net, security always a subconcious primal need. mammals need firefox. That was one meaty article… Thank you! Congratulations Firefox, my main browser since 0.9 version came out. all the best. I’ve downloaded other internet systems, but Mozilla Firefox is the best..It is the fastest.. Hats off to the developer community.. You have given us a great product.. I started using firefox from jan 2006,after starting to use firefox i felt IE seems to be a crap. I wish the founder of mozilla and all the developers all the best. Fantastic work promoting open-source concepts and add-on’s. Mozilla and Firefox have made it possible for even the most techo-challenged Grandmothers like myself to enjoy the richness of the internet customized in ways that suit my needs. I wish you the best going forward from here. I couldn’t make a living without you! Thank you Firefox! I’m the biggest fan of Firefox. it’s an amazing browser and you already made the web better so many thanks to you and continue doing it even better and better. Firefox is and always will be my favorite Browser. Why is the logo a red star? Are you communist? WoW is about all I can say I remember using the web way back when Netscape was still around it’s come a long way since then and certainly a LONG way in the past 5 years. It makes it a lot easier to write web pages as you know how they are going to handle there is no need to hack the page or stylesheet for the layout like I’ve had to do for IE6. It did force MS to up it’s game and look at what they did with IE 7 tabbed it, amazing Firefox inovates the rest follow. IF Only you could get some website to come out of the dark ages and support Firefox properly, YES there are a few out there that don’t do it, I know shocking isn’t it..
It`s the best browser that I have ever seen! I hope that firefox will get better and better! Congratulations, great work has been done and you guys are an important influence. That being said, I think it’s a bit presuming to only call Firefox, Chrome, Opera and Safari “modern” browsers and exclude IE. With the direction Firefox and IE have developed lately, the latter’s v8 currently pretty much owns the former’s v3 in regular day-to-day usage. Just be careful to not mess up the momentum you’ve built for yourself. Happy birthday Firefox! You’ve changed my web surfing experience forever! This is the best browser I’ve ever used! Happy Birthday Firefox! I use your web browser every day and it’s awesome! Happy B-Day Firefox! I have been using it since 2005. Firefox has been providing a veritable alternative in the browser space; i am sure it will continue to grow and make more improvements …Goodluck! Thanks for letting web browsing more dynamic! UnMHT 5.4.0 and Mozilla Archive Format 0.16.4, the last one didn´t open my file, the first addon does not work correctly! So party but work better! MAKE EIT Solutions – web design and web development company India, use Firefox as the official browser for most part of work. Firefox is the best web browser. Been using Mozilla browsers on a variety of OSes since Netscape 3, always did like the alternatives to MS.
grace à vous, on n’est plus obligé d’utiliser internet explorer ! Congratulations on your 5th birthday! I started this last year, and I love the cute Foxkeh! I even named my reindeer after one. Happy Birthday to Firefox….hope that ur team will upgrade more features to this awesome browser…May the force be with u always..
Firefox is the best, authoritatively i say this, because, i have tried to use other browsers and not had that experience that Firefox brings…thanks guys. Hey firefox developers! Thanks for the hard work, firefox really changed websurfing for me, from security to tabbing and addons, it really made web better. Congratulations Firefox, you filled the void Netscape left, but are doing so much more, when I load software, you are at the Top of my list, amazingly you get better every day,, Happy Birthday, and a job well done!! Firefox has served me some of the best web pages for many years. I am still convinced that it is the world’s best browser. May the next 5 years be just as great as the first 5! What makes firefox stand apart from its competitors is the add-ons. I just love them! Life is so free-flowing with Down’em all, Bug me not, Greasemonkey, Web of trust and the list goes on.. Kudos to firefox!! Keep rocking. Happy birthday to the world’s best browser! hello its me asad this is my first post here i have been using firefox since its launch and its awesome the speed of browsing and also the downloads so much faster than ie or opera or any other browser. THANKS TO MOZILLA FOUNDATION THAT THEY HAVE DEVELOPED THIS BROWSER WITH ALL THEIR ETHICS AND HAVE MADE IT SO SIMPLE AND FAST LIKE WE ALL WISHED A BROWSER TO BE. HAPPY TURNING 5 GOOD LUCK FOR THE FOUTURE.I HOPE FIREFOX RULES THE SURFING WORLD. Congratulations Firefox. Your innovations and your battle with IE has kept the web from stagnating. As a software developer we would have made so little progress if we only had IE to choose from. With your addons and its community there is no limit to where we can take firefox in the next few years. Changed how look at internet & browse it …. 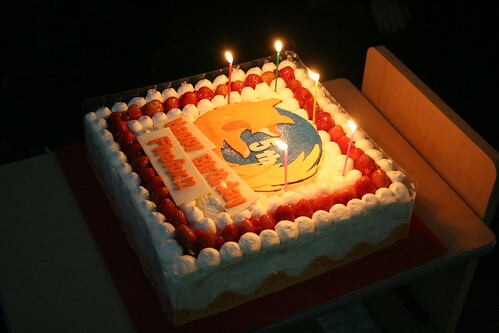 Happy 5 yr Birthday Firefox!! firefox stand apart from its competitors is the add-ons. I install fist on my computer were my operating system is win 2000 or etc. I used firefox since 2006. I proud fill when my trick work on only this browser.It’s my default browser. You done this job always honestly. Happy Birthday, and a job well done!! …Many many thanks and miles of appreciation to all of you….. I live by Firefox. When I found it I was in love! It gives simple plain options without all the dangers of that other big browser. I love the control I have. I do use Chrome as well. I never use that other Big Browser. Firefox is absolutely amazing! It runs better, in my opinion, than IE and feels much more secure. I’ve been using it since 2007 I think…and I prefer to use it at ALL times. But, sadly, some sites will only run on IE. Hopefully, all sites will be compatible with Firefox. You are the best browser, my only browser and I wouldn’t venture into the net without you. Keep it up and always keep your users first. I used Firefox mainly because of the multitab feature and the popup blocker, then it won my favors regarding security and speed. That was Firefox 1.5 then. hello although not much English is the important thing is to join the celebration of the best five years of Internet browser, Congratulations and keep going forward to improve. thanks. I thought Firefox was fantastic in 2004 and 5 years later, it’s still the best of the best! Happy birthday FF, we love ya! Thanks 4 completing five years. Firefox is simply best browser with some extra features. I like private browsing, deleting all history by one option, support hindi font for some hindi wesites. Multiple tap is one of the best feature of it. But it requires some improvements like it crushes during loading heavy websites. IE has a advantage when playing youtube video, it remember the played links and if we again play that link it directly starts without buffing again which makes IE special, so please try that also. But anyway thank u for yours free services. great work, god bless firefox. Meus parabens meu querido amigo Firefox. Parabéns Firefox. Realmente vc veio para revolucionar, e fazer com que a concorrência lhe copiasse. Sempre fazia preferência para o seu uso, onde quer que eu entrasse on-line. Você tornou-se para muito o “pão nosso da toda rede”. Muito mais sucesso, e mais evoluções!!!!! Happy Birthday Firefox!!!! I love you. Been using Firefox for several years, and just finally got all of my family members converted. Happy 5th FF!!! Firefox is going head on with the empire and winning the battle! Congratulations on 5 years of success! A DAY NEVER GOES WITHOUT FIREFOX!!! INTERNET EXPERIENCE HAS TO BE SCALED AS ‘BEFORE FIREFOX’ & ‘AFTER FIREFOX’….. Thank You FIREFOX and HAPPY BIRTHDAY!!! you saved me from IE…. You are the best firefox, keep the fire burning and let the fox running…. the force is strong with this fox..
happy birthday firefox, keep to shine! I like Firefox but it is a little “big” for netbooks. I still use Internet Explorer 8, but sometimes I use Firefox, I hope that in the future, Firefox will be much better than now. Congratulations ! Firefox is undoubtedly is the best.